The Nepal Ministry of Commerce, together with the Asian Development Bank (ADB) held a national validation meeting to share the draft final findings and recommendations of a national diagnostic study on sanitary-phytosanitary (SPS) measures and technical barriers to trade (TBT), launched in June 2016 under the trade facilitation agenda of the South Asia Subregional Economic Cooperation (SASEC) Program. 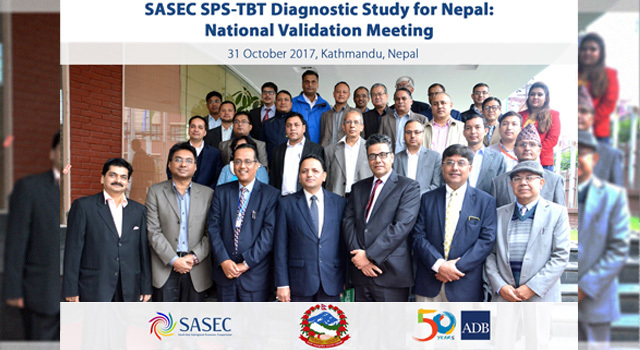 The Nepal SPS-TBT national core group and public and private stakeholders participated in the validation meeting on 31 October in Kathmandu, Nepal, providing comments and feedback on the draft for incorporation in the final diagnostic study. Given the reduction in tariffs over the last 30 years due to multilateral and bilateral obligations as well as autonomous economic liberalization, increasing importance is directed toward addressing non-tariff measures, which occur frequently in the form of standards and technical regulations, especially SPS and TBT. Accordingly, SASEC members agreed to develop mutual cooperation processes in the diverse and challenging area of SPS-TBT-related issues to address these barriers. As a first step, national diagnostic studies are under preparation in Bangladesh, Bhutan, India, Maldives, Nepal, and Sri Lanka. Wide-based stakeholder validation meetings are being held in each country as the draft final reports become available. Discussion and additional suggestions on preliminary recommendations for how to address SPS-TBT-related challenges faced by Nepal. Mr. Manoj Acharya, Under Secretary, Ministry of Commerce and convener of the Nepal core group delivered welcome remarks, noting that the rise in non-tariff measures has led to missed opportunities for SASEC countries to capitalize on potential advantages arising out of falling trade tariffs. In this context, he stated that it is necessary for Nepal to understand the nature of non-tariff measures prevalent in the region to better exploit the immense market potentials that SASEC regions provide. Representing the private sector, Mr. Manish Kumar Agrawal, Chairman, Export Promotion Centre, FNCCI, opened on behalf of the private sector and provided valuable comments for the study. Chair of the session, Mr. Toya Narayan Gyawali, Officiating Secretary, Ministry of Commerce, Government of Nepal thanked ADB and SASEC for their efforts in improving trade and transport facilitation in the SASEC region. Almost 40 participants from import-export trade-related government agencies and a range of private sector associations and organizations participated in the validation meeting. Highly productive discussions concluded in additional inputs being agreed for the diagnostic study, which will be finalized by the end of 2017. ADB supported the validation meeting under regional technical assistance funding.